Gertrude Murrell DuPont Howland doesn’t want to leave anything to chance. Especially not at this stage of her life. She’ll be 102 in July. The Richmond native was a dutiful wife and mother until she divorced and became an archaeologist in her 60s, traveling to digs all over the world: from Afghanistan and Turkey to Italy, Hungary and Czechoslovakia. She traversed the Khyber Pass and went to Hong Kong. Her second husband, now deceased, was happy to accompany her as she became a noted authority on ceramics and pot shards. Her greatest delight was finding hundreds of tiny pieces of pottery that she could painstakingly, artfully reassemble. As this adventurous life unfolded, Gertrude recorded her findings in vivid detail, the people she encountered and events that she can still recall in living color. She is in the process of compiling the many highlights into a memoir – it’s already up to 300 pages. Her wit is sharp, as is her hearing, and she is just as quick to get a joke as she is to give one. Two years ago, she spelled out – in rhyme – how she wished her obituary to be approached. As April is National Poetry Month, it seems fitting to highlight her sentiments. Many can relate, even if they haven’t so eloquently specified their last wishes as Gertrude does in her poem, "Genealogy." She was the mother of so and so. But they are they and I am I. Who loved the hot August sun. Moss like gray lace hung from very large trees. The breathless green of tropical seas. A shining sail up the path of the moon. A dance out of doors to a lilting tune. And a quick-witted argument to sharpen the mind. No need to rush things – she doesn’t have a birthday for a few more months – but she also has made arrangements for her burial and even designed her marker, already in place at Hollywood Cemetery in Richmond, Va.
“I didn’t trust my family to do exactly what I wanted,” Gertrude said recently, “so I went ahead and did it myself.” The tall granite marker features a basket of fruit on top, something she had found on one of her travels and wanted to have to distinguish her spot from so many others. As if she hadn’t already distinguished herself in so many marvelous ways. 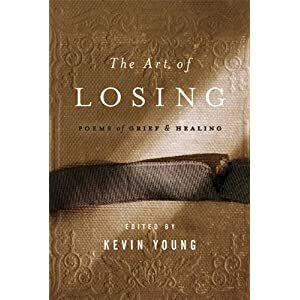 A collection of poems worth highlighting during this poetry month is The Art of Losing: Poems of Grief & Healing, edited by Kevin Young, a professor of English at Emory University and a National Book Award finalist for Jelly Roll: A Blues. The book, published by Bloomsbury USA, includes 150 passages and poems that correspond with the stages of the grieving process, from reckoning to redemption. Susan Soper is the founder and author of ObitKit™, A Guide to Celebrating Your Life. A lifelong journalist, she was formerly the Features Editor at the Atlanta Journal-Constitution, where she launched a series called "Living with Grief" shortly after her father died. Susan lives in Atlanta with her husband.